Pachymetry (measurement of corneal thickness) – In some cases it is useful to know the thickness of your cornea (the clear window at the front of the eye). Thicker than average corneas for example can cause the eye pressures to be measured as higher than they actually are. Having thin corneas is a known risk factor for glaucoma so knowing this fact is useful when screening for glaucoma. 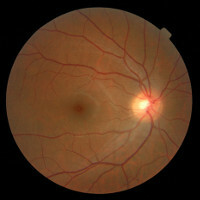 Fundus Photography - Taking a photograph of the inside of your eyes can be useful in explaining any findings we may have made. Photographs can also be useful in monitoring for change to any observations from one visit to the next. Topography - this piece of equipment is used to take a scan of the shape of the cornea. This is needed to fit for some types of contact lenses and is used to diagnose the presence of certain corneal conditions (e.g. keratoconus and pellucid marginal degeneration).